If locked manually, all doors are locked. If unlocked manually, only the driver door is unlocked. Observe information on the anti-theft alarm . Fold the key bit out of the vehicle key . Insert the key bit into the lock cylinder and lock or unlock the vehicle. 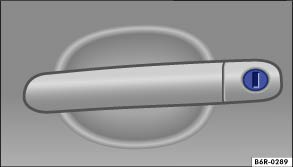 If the vehicle has a lock cylinder in the door handle of the front passenger door, the procedure for manual locking is the same for the front passenger door. The anti-theft alarm stays active when the vehicle is unlocked. However, the alarm will not be triggered . Open the driver door. The alarm will be triggered if the ignition is not switched on within 15 seconds. Switch on the ignition. When the ignition is switched on, the electronic immobilizer detects a valid vehicle key and deactivates the anti-theft alarm system. The anti-theft alarm is not activated when the vehicle is locked manually using the key bit .